Ælfheah was probably murdered here at the site of the St Alfege Church, Greenwich. 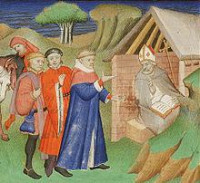 Ælfheah (Old English: Ælfhēah, "elf-high"; 954 – 19 April 1012), officially remembered by the name Alphege within some churches, and also called Elphege, Alfege, or Godwine, was an Anglo-Saxon Bishop of Winchester, later Archbishop of Canterbury. He became an anchorite before being elected abbot of Bath Abbey. His perceived piety and sanctity led to his promotion to the episcopate, and eventually, to his becoming archbishop. Ælfheah furthered the cult of Dunstan and also encouraged learning. He was captured by Viking raiders in 1011 and killed by them the following year after refusing to allow himself to be ransomed. Ælfheah was canonised as a saint in 1078. Thomas Becket, a later Archbishop of Canterbury, prayed to him just before his own murder in Canterbury Cathedral.